Viz’s 2009 publication of Taiyo Matsumoto’s GoGo Monster received a lot of love when the time came for year-end Best Of lists, and now this fashionably late reader knows precisely why. This is as good a comic as you’re likely to find out there on bookshelves, and before I continue to gush over its contents, I’ll go ahead and suggest you do go find it. Hit up comic shops, hit up Borders or whatever store you fancy, and come home with a treat you’ll return to time and time again. In actuality, it should be no surprise that GoGo Monster is as good as it is. 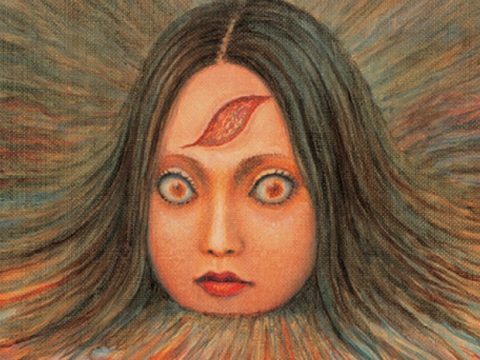 Matsumoto has made a career out of crafting highly rereadable stories, whether it’s to take another thrilling trip through that particular narrative or to just ogle his fine artwork. Perhaps some of you have taken that dive before, whether it was with Blue Spring, No. 5, or Viz’s own thick release of Tekkon Kinkreet (AKA Black & White). The latter was my first exposure to the man during the days of manga anthology PULP, and I haven’t looked back since. The story here centers on Yuki Tachibana, a loner student who goes by much less flattering names if you ask his classmates. He stands out initially, with his long unkempt hair. He scrawls strange drawings all over desks and makes exclamations and claims nonsensical to anyone but him, but he’s more than an introverted weirdo with a wild imagination. Or is he? That’s for the reader to decide should they so desire. Whether he’s simply delusional or not, Yuki has his foot in two worlds. One is our very own: sun-drenched playgrounds and laughing kids just trying to get home and play games with their friends; faculty members attempting to keep order and, like their students, make it through another day. The other is a darker world populated by monsters both large and small—cackling faces in raindrops and shadows and clouds—and something big is gearing up on their end, affecting everything both in and outside of their shadowed confines. Not everyone avoids Yuki like the plague. Newcomer Makoto Suzuki ends up sitting next to him in class, and gradually becomes close despite Yuki’s inherent, off-putting weirdness. They spend time both in and out of school together, and Makoto remains curious if not skeptical about Yuki’s tales of the other side. He’s very much a proxy for the reader that might also find themselves drawn to Yuki, and their relationship evolves and branches out in a way that’s fittingly reminiscent of true childhood companionship. Despite the urgency to Matsumoto’s artwork—the squiggly lines that create an illusion of constant movement, clashing with their own meticulous detail—the story has a relaxed pace to it. While certain qualities could be described as filmic, the impression I got from reading Gogo Monster was actually closer to reading a novel. Granted, it makes for a very strange novel, but the similarities between the experiences are hard to shake. This style also comes across in the way the book is divided into seasons, and this isn’t just something used for convenient chapter distinction. The overall look changes from season to season, both in terms of the environment (naturally) and the appearance of every single character. It took me a second to notice that everyone was tan throughout summer; they sport different hairstyles, even different attitudes as the leaves fall and made way for winter. The sum is more than a collection of slight visual details, it affects the entire mood of Matsumoto’s work. GoGo Monster is a rewarding read in many ways, and a great deal of the payoff comes with what each individual takes away from it in the end. The best stories leave us with at least a few questions, giving us a reason to return and explore once more. GoGo Monster does just that, and is one of the finest comics I’ve read in some time. Taiyo Matsumoto is a master at what he does. If you haven’t discovered why yet, this is a great place to start.